Ingredient called catechins which are synergestic with vitamins E and C, Protective against digestive and respiratory infections and can reduce the cancer-promoting actions of carcinogens and ultraviolet light. 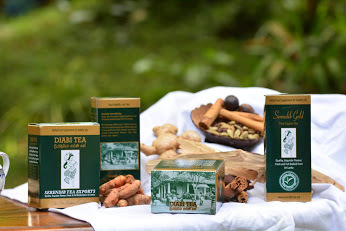 The taste and uplift the effect by right combination of 22 Ayurvedic herbals like Ceylon Cinnamon, Terminalia chebula, Emblica Officinalis, Terminalia Bellirica, Syzygium cumini, Cardamom, and Sandalwood with pure Ceylon black tea. Now the taste is almost like a natural cup of tea and effectiveness has increased due to natural ingredients and it is directly absorbed into blood stimulating insulin production naturally. Ingredient called catechins which are synergistic with vitamins E and C, Protective against digestive and respiratory infections and can reduce the cancer-promoting actions of carcinogens and ultraviolet light. By Serendib Herbal Tea Exports in Ceylon Tea News, Serendib Diabi Tea, Serendib Herbal Tea Exports on January 6, 2013 .